Chuck Ingels, project leader; assistance by Ria DeBiase and the FOHC orchard group. 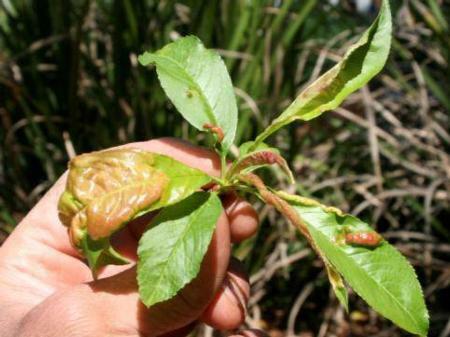 Peach leaf curl is a disease caused by the fungus Taphrina deformans. 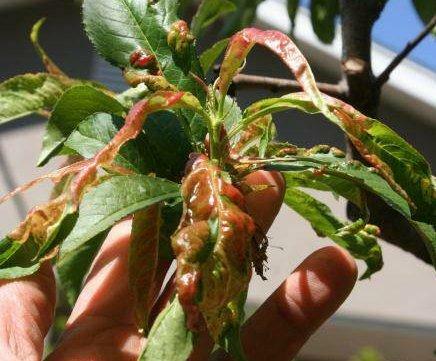 It is one of the most common disease problems for backyard gardeners growing peach and nectarine trees. 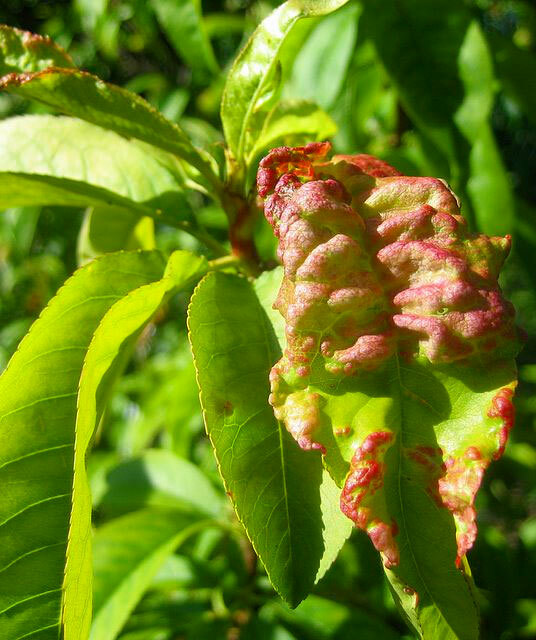 Periods of cool, wet weather when leaves are first opening on the tree, favor development of peach leaf curl. Cool temperatures and wet conditions for more than 12½ hours are required for infection; maximum infection occurs when trees are wet for two or more days. If rains do not occur when leaves are first opening, the fungal spores that cause the disease remain inactive and little or no infection occurs. In the past, peach leaf curl could be successfully controlled with lime sulfur fungicide or Microcop, a fixed copper fungicide. These products were removed from the retail market beginning in 2010. 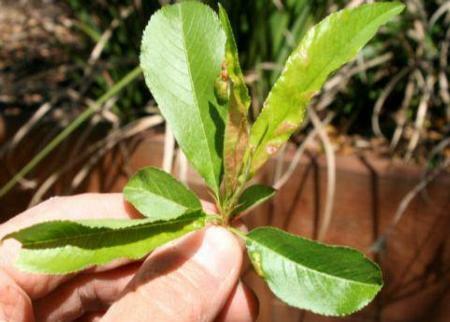 The only fungicide products left for treating peach leaf curl are those containing lower levels of copper (such as Liqui-Cop), copper soap, and the non-copper synthetic fungicide chlorothalonil (labeled by US EPA as "likely to be carcinogenic to humans"). The trial at the Fair Oaks Horticulture Center demonstration orchard (and one tree in a private yard) was undertaken to determine what works best for controlling peach leaf curl now that the most effective products are no longer available to home gardeners. 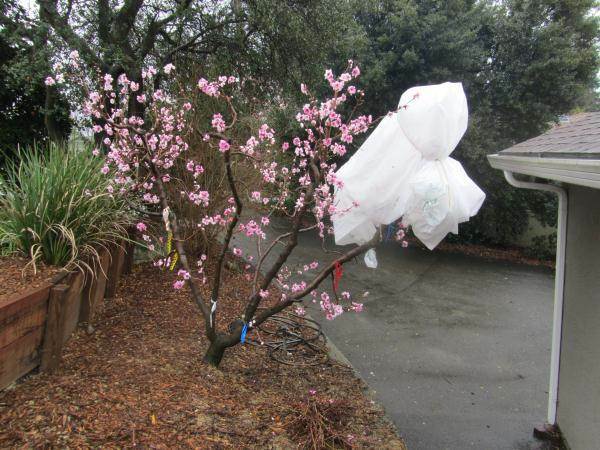 Different treatments were used on individual branches of 14 different varieties of peach and nectarine trees. 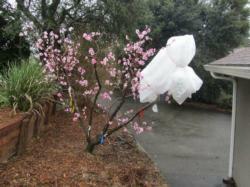 Not all trees were treated with each product, and a branch was left untreated on each of ten trees. Twenty shoots per branch were evaluated. 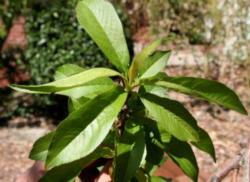 Due to differences in variety susceptibility, the data were converted to percent of untreated branches, and then converted to the inverse—percent control of peach leaf curl. 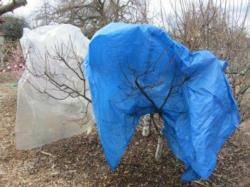 Plastic coverings isolated individual branches as they were treated. Agribon row cover fabric was secured over individual branches to attempt to keep them dry while allowing some air movement to prevent overheating on warm, sunny days. 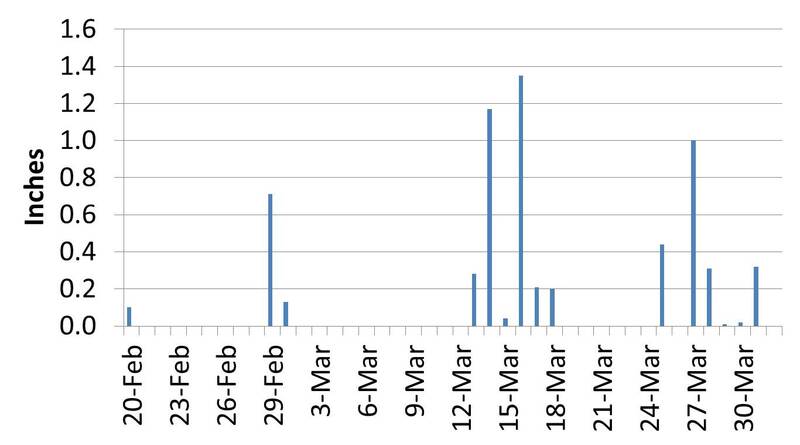 Each shoot was evaluated on March 30, 2012 for the percent of leaf surface that was infected, as shown below. The average severity rating of all 20 shoots was calculated and averaged for all the branches in each treatment. Statistical analysis was used to determine if differences were significant. At right, no foliage damage. Click on a thumbnail below to see larger images of the damage compared with no damage. Compared to untreated branches, those treated with Liqui-Cop averaged about 70% control, copper soap 80% control, and Agribon by itself just under 60% control, but these treatments were not statistically different. Agribon generally kept the branches dry, although some moisture was evident after heavy rains. Two treatments provided nearly complete control: (1) Agribon plus Liqui-Cop, and (2) lime sulfur (late fall) followed by Microcop (late winter). Maxicrop (kelp) did not work at all and substantially increased the severity on some of the branches. 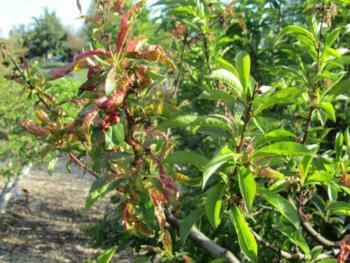 Not all peach and nectarine varieties are equally susceptible to peach leaf curl; some differences in response may depend on the variety. See Table 1 for the actual percent incidence and severity of untreated branches of the ten varieties evaluated. It appears that four of the varieties tested may be less susceptible to peach leaf curl. The two liquid copper products have fairly similar efficacy—they improved control and perhaps sufficiently, but still not great. 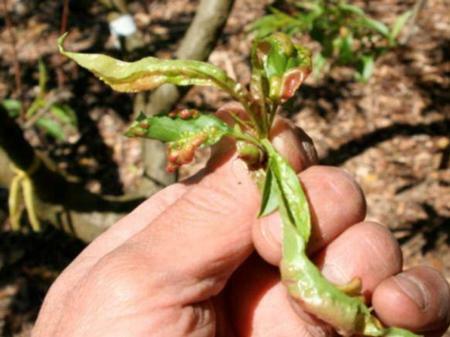 The control achieved, although resulting in some unsightly damage, is probably enough to allow the tree to produce good shoot growth with enough healthy leaves to nourish the rapidly growing young fruit. Agribon likely allowed some rain to penetrate to the branches. It may be best held up with a post in the middle to allow rain to run off down the sloped sides rather than having a flat surface on top, but it must be fastened securely because of strong winds. Agribon plus Liqui-Cop worked quite well, probably because the fairly good control with Liqui-Cop was enhanced by drier conditions. 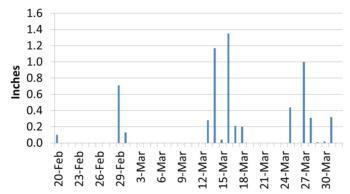 The combination of lime sulfur (in late fall) followed by Microcop (in late winter) was highly effective, as expected. Normally only one of these products was used for both fall and winter applications, but insufficient product was available for both. Maxicrop (kelp), even sprayed eight times, provided no control at all. Table 1. Percent incidence and severity of peach leaf curl on untreated branches of peach and nectarine varieties tested. Incidence is the percent of shoots with at least some leaf curl, and severity is the approximate proportion of the total leaf area on each shoot that is affected. A total of 20 shoots per branch on each of 10 branches were evaluated.